Many of the Sessionettes with the ILP HY248P encapsulated power amps have failed by now, but I've just got a Mk1 in and it's still going strong after 30 years of use. Out of interest - how many out there are still being used regularly with their original 'brick'? My has the HY248 - I'm hopeful it's not the reason it currently out of it's normally regular service. Ironically the amp I mentioned failed a few months later. The modules are not serviceable and have to be replaced if faulty. I'm not sure if mine has failed or if its the preamp - do you know what replacements will work? In another post you referred to the FX return input producing a sound. With these amps you need a pretty high level signal to get a decent output, so a guitar plugged straight in will be pretty quiet unless you run it through a boost pedal set fairly high. However, you should get some output with a guitar and if this is the case (and it's undistorted) then you can check the preamp. To do this you need to run the FX send into another amp. The output is line-level so go into the second amp's low input and keep the Sessionette volume down. If the preamp is working you should get full control functionality and good sound output. The caps in these amps hold up well. When you do get problems, the main filter caps will produce either excess hum and the amp will continue to operate, or they short and blow fuses. You can get coupling caps that dry out and cut the signal, though. Don't change any parts without knowing they're bad - the circuit boards are intolerant of excess heat and pads easily lift, so unnecessary replacement is to be avoided. If the power amp is faulty you only have a few options. For my personal Mk1 Sessionette I designed and built a MOSFET module based on the last design they produced, though with adjustable bias and offset controls. I had plans to make a few of these, but they worked out too labour-intensive to ever be viable. Stewart Ward was selling modules, but they became uneconomical and the last I heard was he didn't intend to supply any more, but it's worth checking with him to see if any are available. 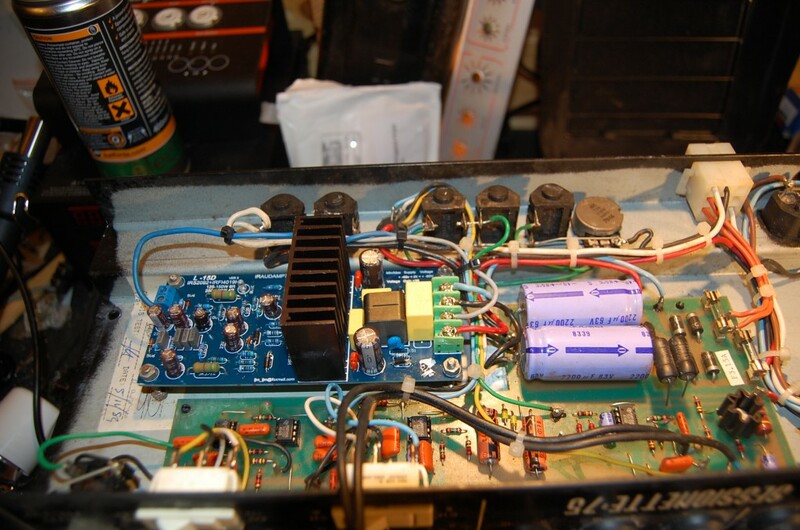 Another route is to fit a ready-made pre-assembled power amp. There are plenty of these around, but the Sessionette runs a comparatively high voltage and very limited space, so care needs to be taken in selecting something that will work correctly. But firstly, you need to make sure where the fault lies. What makes them relatively easy to substitute is that Mr Awards included all his design ideas and mojo in the very good preamp, and let the power module to "just drive the speaker" and not much else. Only 5 pins to connect: +V , -V , Ground , IN , Spk OUT. No tricky NFB , just fixed internal one; you feed it power, inject preamp signal on one end of the brick, drive a speaker from the other end. That's what his own replacement module did, with only the very minor inconvenience of drilling 2 new mounting bolt holes on thye heatsink/backpanel. I'm quite certain that *any* 100W power module which is happy with that rail voltage and with output transistors bolted to an L shaped aluminum heat spreader which fits in the available space will work fine. If you find any candidate at some established supplier (if possible avoid EBay) and have any doubts, post link here so we see it. I've heard back for the 'repair' shop chap he tells me the power amp is working - but the some thing on the pre amp has failed - but he cannot tell me what it is. 1)m you can't mount the LA100B , it's already heatsinked !!!! 2) Mick Bailey's is perfect. My generic power module is very similar, and many others, because it's a general purpose üniversal" solution module, maybe you can buy one from Mick or get something in that line. I'm 6000 miles away or I'd offer one of mine at cost ... but freight is a deal killer. 3) not a very good repair shop, considering the schematic is available and he could at least have traced signal along it. Even without full repairing it, he might at least have found that "signal stops at the tone controls" or whatever. That said, Sessionette 75 has a switch, usually called "EQ In" , which switches EQ OFF. Maybe you set it off or old contacts got stuck or dirty and locked it in the OFF position. Inject some MP3 at the amp input to have both hands free and check all pots and switches, in all positions, then confirm here which do NOT work. Thank you again! A novice like me really appreciates the advice! Very annoyed with 'repair' shop - filled me with hope he could tell me the problem! Last edited by TheUnWiseOne; 05-21-2016 at 09:52 PM. Some repair shop. Maybe a good living can be had from charging £20 a pop to tell a customer you can't fix something. Not much job satisfaction, though. Did you try connecting the FX send to another amp? I refused to pay! It was the hope he generated that miffed me more! He went from confident he could tell me one day to sheepish the next ! If I play a 440 test tone from my phone and youtube its much clearer through internal speaker. IF you are going from Preamp Out (FX Out) in the Sessionnette or most any am p into another amp's normal (guitar) input you may easily overload it, that is not a defect but misuse. Try again but go from Eff Out to the other amp Eff In or Power Amp In, that should match levels. Or use the 'Monitor' output and set the level with the monitor output control. In the early 80's , definitely *before* Internet or even personal computers, there was this Tech guy, nicknamed "El Digital = the digital one" who was both famous and hated. No "normal" Tech took digital or complex stuff, think keyboards, MXR 1 second digital delay, DBX compressors/limiters, harmonizers, etc. but him. We couldn't because of absolute lack of data (remember, no Internet and averything was on paper , period) , no service manuals, no access tomparts even if problems successfully identified, an absolute desert. 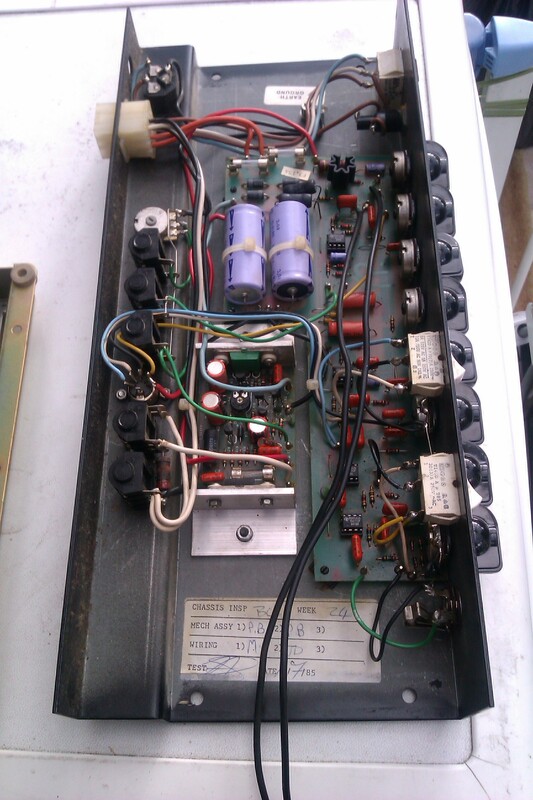 No big deal , even lacking info, to repair any tube amp, or 70s 80s technology SS amps such as Peavey/Ampeg/etc. but the above stuff was impossible. So any such dead or malfunctioning stuff went straight to him. He had a rented 2 room office, you left stuff in the front one, explained the problem, he had some house amp for you to demonstrate the problem , his Lab was in the second room, nobody, I mean NOBODY was allowed inside. I once visited him and he told me: I'll let you in, I know we think alike and won't betray me. I expected to find complex digital analyzers and testing equipment, multichannel high bandwidth scopes, pulse signal generators, the works ... all he had, no kidding, was a needle (analog) meter. My jaw dropped and that's an understatement. * reseat plug in boards, way back then instead of dedicated connector to connector they used plain copper "fingers" etched in the board edge , best case said fingers were nickel or gold plated, in any case grime took its toll. He pulled the board, cleaned its edge, sometimes with a rubber eraser or fiberglass tip pen and reseated, that alone cured 20% of problems. Not bad, huh? .... already 40% real repair success. * used his trusty needle multimeter to check for +/-15V and +5V where approppriate all over the board. For the others, which were over his head at component level, he detected which was the bad board, pulled it, and sent it to USA by his hot Air Hostess girlfriend who mailed it from Miami, LA or NY to original factory, think Moog, Oberheim, Kurzweil, UREI, DBX, etc. which, remember, were located in Continental USA ... and if German/Austrian/whatever certainly had an official service and representative center in, say, NY , think Gotham Audio and such. When the repaired module came back, he reinstalled it and charged twice what he had spent, or more if possible. His success rate was impressive, customers grunted and hated his high prices but nobody could argue his efficiency. Is this the powermodule for the sesionette 75? Do you have a shedule and/or where do you buy these? Sorry for not introduced myself. I am Peter a 60 year old guitar player from the Netherlands that like the sound of the sesionette, special the upgrade one. I buy a poweramp in parts 40 W, because my brother thought that the wattage has split. I am not a technician like my brother. We put the poweramp in and the fuse burns. I have only one fuseholder. Hope someone have some good advice? Looks that the power amp your brother bought is not compatible. 2) has power transistors mounted to an aluminum L shaped heatsink so it can be bolted to back panel as original one. And of course must fit in the available space. Many similar amps are available, only slight problem could be that TO3 (metallic fried egg shaped) power transistors are not popular nowadays, so they should be somewhat harder to find, today most use plastic power transistors , which are fine anyway, the main point being the L shaped aluminum extrusion, so you can mount it . I had to adapt it to use plastic MosFets (IRFP250) because that´s what´s currently available, but kept then old PCB design and L shaped aluminum extrusion so I can repair my own "80's Sessionnettes" , in this case 300W Bass amplifiers which used TO3 metallic 2N3773 ... today practically extinct. EDIT:a far cry from the über complex Roland power amp shown in another thread: just 4 transistors as the main amp, driving 4 power MosFets , plus another TO92 one for Bias . Oh, board also includes +/-63V power supply, +/-15V for preamp, an Opto limiter and 15mA supply for Led. Almost forgot: after mounting I´ll kludge there also the 12V fan supply: a single 1N4002 and a 2200uFx25V cap. Last edited by J M Fahey; 01-30-2019 at 04:18 PM. I had one these a few months ago that was brought back stateside, nice little amp variety of sounds.. Dirty pots and what looks like footswitch problems, but the issue came down to the 15v supply only putting out almost 9v(barely enough to light the LED's in the footswitch) replaced 2 caps in the 15v supply brought the 15v rail back. Footswitch works fine after that. Could one of these - Power Amp be made to work with a suitable heatsink? The build instructions look good and there's a schematic. Edit: I've just noticed it's also available ready built. Last edited by Dave H; 01-31-2019 at 12:42 PM. That Vellemann is an excellent amp and very suitable as general purpose replacement or "plate amp" to build or repair a powered cabinet, but unfortunately does not fit in the *tiny* space allowed inside the Sessionette. You need no extra heatsink, Sessionette uses the thick aluminum chassis for that, so you bolt there (with some thermal grease in between) either the original ILP brick or a **same width** power amp, which usually means one with an L shaped aluminum extrusion so transistor heat can be transmitted to aluminum backpanel. Or maybe Mr Awards himself built a homemade replacement when ILP supply dried down. IF that specific aluminum extrusion were available, the module could possibly be reproduced, from what I see circuit is tha straight Toshiba datasheet example . Those huge dual bolt transistors are NOT available any more, for decades now. Same but with original fully encapsulated brick. Notice it needs only 5 wires: +52 , -52 , In , Out , Gnd. Any replacement must be able to use those. No need to thermally join it to back panel, since it has its own heat sink. The one I worked on was not covered either. I was the only to work on it. Guy bought it in England when he was in the military. Originhal ILP were all potted, of course, that was the key of ther product line. They must have sold thousands, so when original Company disappeared I bet a small cottage Industry must have developed and thrived for a few years just on the replacement market. The circuit IS known, in the 80´s Toshiba and similar MosFets were still available, so only somewhat hard to source component must have been the aluminum extrusion. Now that my interest refreshed I might search for a suitable extrusion (commonly available) and make my own, go figure. For what it's worth here are a couple of schematics of ILP amps I've hacked into, not guaranteed 100% accurate of course. Thanks, very interesting and afaik look good. Were they open or you had to submerge potted brick into some ungodly liquid? That said, this is reinforcing my idea of building some similar brick, with screw-in wiring, so Musicians can replace their own. Freight costs in Argentina went through the roof , it IS a large Country (superimposed on Europe would stretch from Germany to Lybia, on North America from mid Canada to mid Mexico ) so for me it´s cheaper (or same cost) to send a brick one way than full amp (or head) both ways. I use toaster oven to heat them up to about 300F then pick away while it's hot. The epoxy they used is very tough even then as you can see. Components get broken. This method works very well sometimes, depending on the type of epoxy. On the left are two HY364s, on the right is an HY124 that I never traced out - not worth the trouble. As of your technique: yes, epoxy becomes brittle with heat. I do the same, but with a narrow stream heat gun and a dental pick to crack it out, bit by bit, and forcefully "disassemble" speakers, think high power JBL, EV and such, for which there is no way to get original cones here in Argentina, so I have to reuse them. Also a rotary file, either conical or ball, mounted on a Dremel. Your boards cracked inevitable because any temperature which affects potting epoxy will also affect PCB base material. Doubly so those paper phenolic ones, but even glass-epoxy ones will be much weakened, by definition. I was surprised at the amplifier complexity, I expected much simpler ones. Of course these used plain bipolars and not expensive Mos Fets and they had to add good short protection so they last long beyond warranty period. Hello guys, I need some help with my sessionette 75, that stopped working during a concert some time ago.. So Im thinking about getting some new power amp for my beloved Session.. I would like to ask you what do you think about these modules I found online and whether you would use them in this situation..
Also I measured about +-55V across the rails, which seems little bit too high.. Is it ok for both power amps?? The top one does not even have matching schematic and PCB, go figure. Maybe they thought "hey, those buying ready made amps can´t read schematics" or something similar. The second one won´t stand those high voltage rails. Read supply specs, you expect someone saying "supply up to +/- 60V ... recommended +/-55V" or thereabouts. Problem is also that it must fit in the limited space available and use the aluminum back panel as heat sink. Thank you for your quick reply I m going to keep looking for the right module. Old ILP bricks were sold as "use anywhere" power modules, so sensitivity must have bewen between 500mV and 1 V ... and Sessionette preamp was designed to work with that. My point being that most "normal" power amps will work there. * stand +/-55V ... because that´s the unloaded "raw" supply voltage, that´s why I now suggest you search for a 150/180W amplifier ... since they use such voltage rails. "100W" ones use around +/-40V rails (again, Raw unloaded voltage) , a few +/- 42 to 45V ones ... sadly not enough. * fit in the available space. (non-tube) Sessionette 75: repair or gut? Any more info? Sessionette:75 - Celestion G12-80 dead?